Vietnam plays an important role in the “New Southern Policy” of the Republic of Korea (RoK) government of President Moon Jae-in, said new Speaker of the RoK's National Assembly Moon Hee-sang. During his reception for Vietnamese Ambassador to the RoK Nguyen Vu Tu on July 30, Moon Hee-sang said Vietnam-RoK relations have been developing strongly in all spheres since the two nations officially established diplomatic ties in 1992. The Speaker took this occasion to thank Vietnam for its arrangement for President Moon Jae-in’s visit to the country in March. Tu congratulated Moon Hee-sang on his new position and wished him success and having contributions to the development of the bilateral relationship. 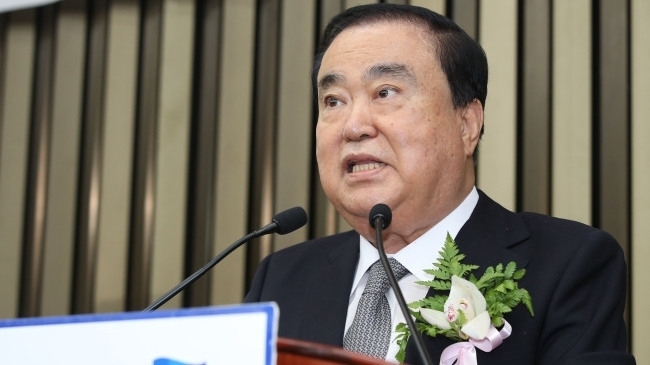 Relations between Vietnam and the RoK as well as between the two legislatures have been growing fruitfully, he said. The RoK is currently Vietnam’s largest foreign investor, with total registered capital of over US$60 billion by the end of July 2018, Tu noted, adding that the RoK is now the second-largest trade partner of Vietnam, with two-way trade exceeding US$60 billion in 2017. Last year, around 2.5 million Korean tourists visited Vietnam while the number of Vietnamese holidaymakers to the RoK surged by 70 pct, he said. The ambassador added that people-to-people exchanges have been held at all levels and in all fields. Tu proposed the RoK parliament and the Speaker pay more attention to developing bilateral relations, create favorable conditions for the exchange of delegations at all levels, and support the Vietnamese community, including Vietnamese women who get married to Korean men and Vietnamese guest workers, as well as facilitating the Vietnamese Embassy’s operations.